The Cleveland Browns had a 5-3 record and were trying to keep pace with the division-leading Steelers as they faced the San Diego Chargers on November 13, 1972. Head Coach Nick Skorich’s team had started off slowly, losing three of its first five contests, but had a three-game winning streak going coming into San Diego. Third-year QB Mike Phipps had been handed the starting duties in the second week of the season and displayed poise. HB Leroy Kelly and FB Bo Scott were aging but still dependable runners. The defense had problems against the run but, with young CB Clarence Scott and FS Thom Darden in the backfield, was sound against the pass. The Chargers, under Head Coach Harland Svare, were heading in the opposite direction. They had lost four straight games and were a dismal 2-5-1. QB John Hadl had been effective in the team’s former pass-oriented offense, but bridled with the switch to a ground-based attack that featured HB Mike Garrett and FB Cid Edwards. San Diego had invested heavily in aging players, and it was not proving to be a sound strategy. There were 54,205 fans on hand for the Monday night game at San Diego Stadium. The Chargers drove methodically down the field on their opening possession. They kept the ball on the ground with Garrett and Edwards carrying the load and John Hadl throwing to Garrett for a 13-yard gain on a third-and-three play. However, after going 73 yards to reach the Cleveland four yard line, Hadl fumbled and DE Bob Briggs recovered for the Browns. The teams traded punts for the remainder of the first quarter. In the second quarter, the Chargers put together another long drive of 49 yards that ended with Dennis Partee kicking a 26-yard field goal. After another exchange of punts, the Browns started off at their 33 and moved the ball effectively themselves. WR Frank Pitts gained 13 yards on a reverse and Leroy Kelly ran for 11 yards and caught a pass from Mike Phipps for a 27-yard gain. Phipps threw to Bo Scott for 24 yards and, after a pass interference penalty moved the ball to the San Diego one, Phipps gained the last yard for a touchdown on a quarterback sneak. 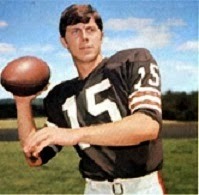 Don Cockroft added the extra point and Cleveland was ahead by 7-3, which remained the score at halftime. The Browns took the second half kickoff and drove to midfield before LB Rick Redman intercepted a Phipps pass. They got the ball back two plays later when Garrett fumbled for the Chargers, but ended up having to punt. San Diego proceeded to go 86 yards in 12 plays. Hadl completed three passes, a key one of which was to WR Gary Garrison for 15 yards in a third-and-12 situation, and the last for a four-yard touchdown to Edwards. Partee added the PAT and the Chargers took a 10-7 lead into the fourth quarter. Cleveland was on the move as the third quarter ended, with Phipps tossing an 18-yard completion to TE Milt Morin on third down to close out the period and then starting off the final quarter with a 19-yard pass to Pitts that reached the San Diego 33. Seven plays later, FB Ken Brown went two yards up the middle for a touchdown and, with Cockroft’s extra point, the visitors were back in front at 14-10. The teams traded punts before the Chargers came back with another score. Starting off at their 39, they primarily stayed on the ground as Garrett and Edwards ran well and Hadl threw to Garrison for a 15-yard gain. Garrett capped the drive with a three-yard touchdown run. Partee added the PAT and, with 1:21 remaining to play, San Diego appeared to be in control and set for an upset with a three-point edge. After HB Bill LeFear ran the kickoff back 24 yards, the Browns started off from their own 36. Phipps tossed a screen pass to Brown for seven yards and then connected with the fullback again for a 19-yard gain. On the next play, Phipps went long for Pitts in the end zone, and he pulled it down for a 38-yard touchdown. With Cockroft’s extra point, Cleveland was suddenly ahead by four. There were still 33 seconds left on the clock as the Chargers took possession at their 13 following a clipping penalty on the kickoff return. Hadl completed a pass to TE Pettis Norman for 24 yards to the Cleveland 45, but two more passes fell incomplete to end the game. The Browns came away with a 21-17 win. The Chargers had the edge in total yards (327 to 299) and first downs (24 to 18), and were especially effective on the ground, where they generated 191 yards of their total. However, San Diego also turned the ball over three times, to one suffered by Cleveland. Frank Pitts was the star on offense for the Browns as he caught 5 passes for 96 yards, including the game-winning touchdown, and despite suffering from a back injury. Mike Phipps completed 13 of 21 throws for 186 yards and a TD with one intercepted and also ran for 17 yards and a score on four carries. Leroy Kelly rushed for 67 yards on 17 attempts. For the Chargers, Cid Edwards (pictured at left) gained 91 yards on 17 rushes and had three pass receptions for 34 more yards and a TD. Mike Garrett contributed 89 yards on 24 attempts and also scored a touchdown in addition to catching a team-high four passes for 29 yards. John Hadl was successful on 12 of 21 tosses for 140 yards with one touchdown and one interception. Pettis Norman led the club with 47 yards on his three catches. The win kept the Browns a game behind the Steelers, who they defeated the next week. The winning streak reached six games and the loss in the return engagement at Pittsburgh was the only one the team suffered for the remainder of the regular season. Cleveland ended up with a 10-4 record, good enough for second in the AFC Central and a Wild Card spot in the playoffs. The Browns gave the undefeated Dolphins a good scare in the Divisional round of the postseason before falling. The Chargers, meanwhile, continued to struggle and finished at 4-9-1 and at the bottom of the AFC West. 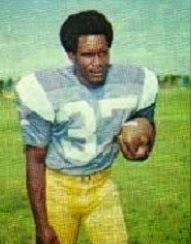 Mike Phipps (pictured below) went through his ups and downs, completing just 47.2 percent of his passes for 1994 yards with 13 touchdowns and 16 interceptions. 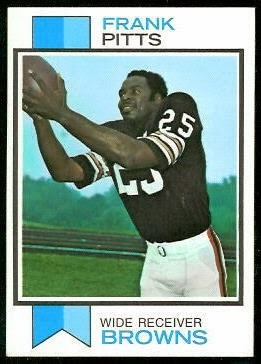 Still, the team did well, although Phipps would never develop into the star that Cleveland had hoped he would be when they traded up for him (and gave up Hall of Fame WR Paul Warfield in doing so) in the first round of the 1970 NFL draft. Frank Pitts continued to be Cleveland’s most reliable receiver, leading the club with 36 catches for 620 yards (17.2 avg.) and eight touchdowns. The running back tandem of Mike Garrett and Cid Edwards remained a bright spot in an otherwise dreadful year for the Chargers. Garrett rushed for 1031 yards on 272 carries (3.8 avg.) and caught 31 passes for 245 more yards, ending up with a total of seven touchdowns. Cid Edwards ran for 679 yards on 157 attempts (4.3 avg.) and had 40 pass receptions for 557 yards, with an impressive 13.9 average per catch out of the backfield. He also scored a total of seven TDs and was named team MVP.